Faced with an increase in shootings, large-scale homicide investigations and two mass casualty attacks, this year has been taxing on Service members who have responded above and beyond the call. 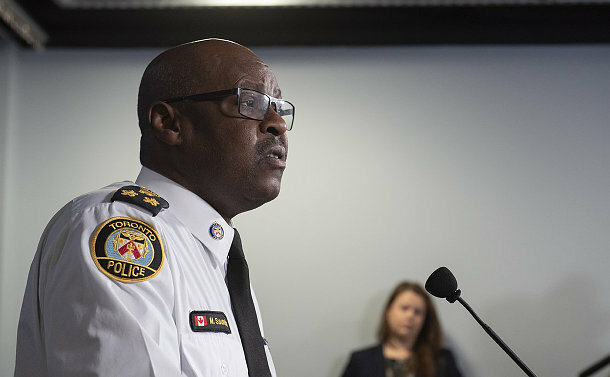 At his year-end news conference at police headquarters on December 27, Chief Mark Saunders listed some of the cases that dominated the public’s interest and the Service’s time. They included the active investigation by a team of experienced investigators into the double homicide of Barry and Honey Sherman and the Bruce McArthur serial murder investigation. The self-employed landscaper was charged with eight counts of first-degree murder. Last April, Alek Minassian was charged with 10 counts of First-Degree Murder and 13 counts of Attempted Murder after it’s alleged he used a truck to target pedestrians on a busy city street before being arrested in a gunpoint takedown. “The attack touched every area of the TPS from the Communications dispatchers who took those first 9-1-1 calls to frontline responders and those on the investigative team,” Saunders said. In July, an 18-year-old woman and a 10-year-old girl were killed while 13 other victims – ranging in age from 10 to 59 – were treated in hospital after 29-year-old Faisal Hussain opened fire on Danforth Ave. The suspect died after the attack. Chief Saunders said the mass attacks on innocent people in the space of two months were game changers. 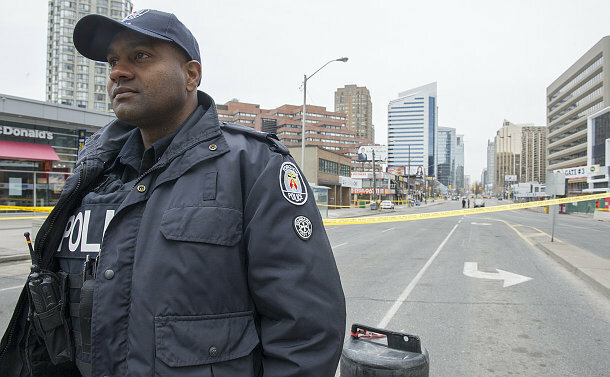 Constable Marc Madramootoo was one of many officers holding the perimeter around the two-kilometre scene of the Yonge St. van attack. The Chief said the Service is committed to working proactively to keep young people out of gangs and working with law enforcement partners to root out guns, gangs and drugs and rescue children from sexual assault and exploitation. 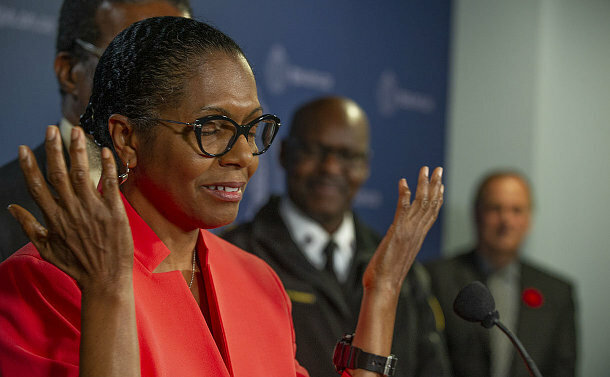 He also reminded the city of a great outcome, as a Toronto mother – Lyneth Mann-Lewis – and her son were reunited after more than three decades apart. In June 1987, Allan Mann Jr. abducted his then 21-month-old son, Jermaine, after his mother dropped him off for a court-ordered weekend visit. Investigative work by the Toronto Police Fugitive Squad, the United States Marshals Service and the Missing Children Society of Canada led American law enforcement authorities to identify the father and son living in the United States. There was an increase in all major crime indicators in 2018, a trend seen across the continent. With the homicide count standing at a record 95, there has also been a rise in shootings which is about seven per cent more than 2017. Nearly 1,600 guns – the majority handguns – have been seized so far this year. The previous record for homicides was 89 registered in 1991. While working to keep the city as safe as possible, Saunders said the Service continues to evolve, making many changes to improve its delivery and create a modernized working environment for members. 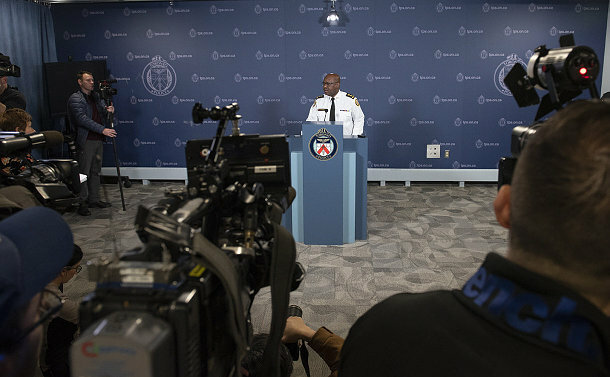 “We are hiring, we consolidated a number of our units and moved towards a district model, we are piloting new schedules, we are working in co-operation with the Toronto Police Association to ensure we have the right number of people in the right places at the right time, we have changed how we respond to various calls for service like parking complaints and thefts from LCBO and gas stations and we have deployed naloxone to many of our officers who respond to the most number of opioid-related overdoes,” he said. The Chief said the Service’s enhanced Neighbourhood Officer Pilot launched in October will run until 2019. “Based on feedback from our original program, these officers are assigned permanently to eight neighbourhoods in four divisions and with more targeted training and job responsibilities, they are building trust and relationships between the TPS and the communities they serve,” he said. Internally, Saunders said the Service has implemented a new set of core competencies, recommendations for improving the culture and are promoting its people thus ensuring the right people end up in the right places, even within the organization. “All of these steps continue to deliver on the three goals of our multi-year modernization process of being where the public needs us the most, creating community partnerships for safer neighbourhoods and responding to the complex needs of a large urban city,” he said. Despite the challenges, Service members have performed thousands of great acts to help the city.